His Morning Phase album beat Beyonce's self-titled album for the big prize, prompting Kanye West to step up to the stage and protest. Beck insists he wasn't upset by the rapper's comments - because he was also shocked his album had triumphed over Queen Bey's heavily-favoured release. "When I was sitting there and they were announcing everybody, the people I was sitting with, I told them, 'Obviously, Beyonce is going to win - come on'," Beck tells Billboard. 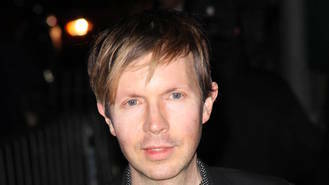 Following his shock win, Beck was a little upset by media reports pitting him against the Halo singer - and he was glad to eventually meet her and clear the air. "I did (talk to her) recently," he explains. "I was really thankful for that conversation. I wrote her a long note after the Grammys, too. Because I saw a bit of that on the internet, where they pit two musicians against each other. The idea of being on one side versus another in music is just preposterous to me." "He never called me, but he was very thoughtful and effusive. I didnât take much offence because I don't know if he knew my music. I kind of got the point of what he was saying."